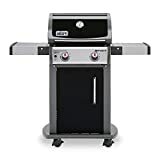 If you really love to grill but you are thinking that just because you have a small space like an apartment or condo, that you may not be able to grill. However, this is not the case because the best 2 burner gas grills are what you are looking for. Aside from not taking up too much space, these kinds of grills have small surfaces and are compact. This is one of the main reasons why they are so great. Not only that, just because they are small does not mean that they perform less than the larger grill burners. As a matter of fact, some of these models perform just as good and better in a lot of cases. Now it comes down to which one should you pick and which ones are the best and top rated. This is where we come in. We would like to make your live a bit more easier by providing you, based on research, some of the best 2 burner units that you can find on the market today. A real solid choice within this price range that you can buy is the Char-Broil Classic 280 Gas Grill. If you are looking for a unit that can get the job done and is up for the task, this one is it. It features 26,500 BTU’s of flaming heat along with 280 square inches of cooking space. This is great when you are dealing with large meals. There is also a side shelve that you can put things on and it also has 6” wheels which makes it easy to move around. To get that real nice barbecue flavor taste, you need a grill that can deliver and the Char-Broil Performance TRU Infrared 300 Gas Grill can do just that. 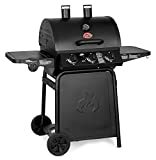 This brand has been around for a long time and they certainly know what they are doing when it comes to making great grills. This unit features 2 burners with the TRU Infrared technology for even better results. It has 300 square inches of cooking space and the side shelves can fold down if you don’t need them at the time. There is also a 120 square inch porcelain coated warming rack and more. Another great choice that has the TRU Infrared technology can be found in the Char-Broil Performance 340 Gas Grill. With this system, it climates flare ups. This is a versatile unit and is great for getting your grill on. It features 340 square inches if primary cooking space and it also has 125 square inches of secondary cooking area on the warming rack. There are dual stainless steel burners that output 20,000 BTU’s of heat along with a stainless steel lid. A unit that has lots of room to grill and bring flavor to our mouth is the Landmann 42202 Falcon Gas Grill. The cooking area is 479 square inches and it puts out 30,000 BTU’s of heat which makes for a wonderful experience. The burner is made of stainless steel, has push button ignition, porcelain coated cast iron grates and more. Last but most certainly not least is the Weber 47100001 Spirit S210 Gas Grill. This stainless steel model is sleek and stylish and is very reliable. Key features include 360 square inches of cooking area with 90 square inches on the warming rack. There are porcelain enameled cast iron cooking grates with push button ignition.